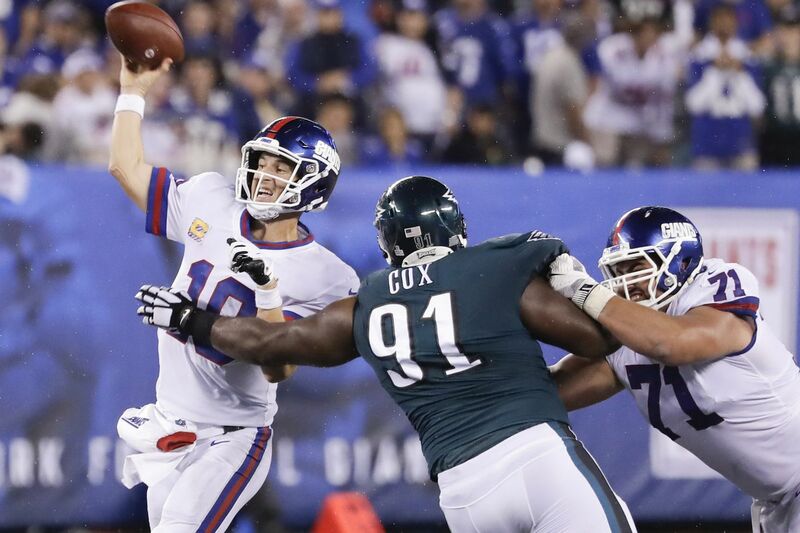 Eagles defensive tackle Fletcher Cox goes after New York Giants quarterback Eli Manning with offensive guard Will Hernandez trying to block him during the second quarter. EAST RUTHERFORD, N.J. — A short week after back-to-back losses. A backs-to-the-wall 2-3 record. A pass rush that too often lately was arriving just as the football was departing. Fletcher Cox knew it was time for him to step up, knew it was time to lead the way. "As one of the leaders on this team, going into a short week, my biggest thing was making sure I started fast,'' the Eagles' All-Pro defensive tackle said after a dominating performance in Thursday night's 34-13 win over the Giants. He rolled, and Eli Manning was rocked. The Giants quarterback, who threw for 800 yards and six touchdowns against the Eagles last season and had been sacked by them just twice in 205 previous pass plays over four games, was sacked four times Thursday and hit and pressured repeatedly in the lopsided Eagles win. Manning completed just 24 of 43 passes and had no touchdowns and an early interception that set up the Eagles' first score. Cox's official stats aren't Superman stuff. He had just one of the Eagles' four sacks and three of their 13 hits on Manning. But he was a non-stop disruptive force inside, collapsing the pocket and setting up Manning for the rest of his linemates. Giants right guard Patrick Omameh definitely will not be relishing the prospect of a Week 12 rematch with Cox. That just might be a good week for him to pull a hamstring. Eagles defensive end Derek Barnett, defensive tackle Fletcher Cox (91) and strong safety Malcolm Jenkins (27) stop Giants running back Saquon Barkley in the first quarter. Defensive coordinator Jim Schwartz did an impressive job of adjusting his coverages to force Manning to hold onto the ball longer than he preferred and giving Cox & Co. time to get to him. "Coach Schwartz did a great job,'' Cox said. "We knew that if we had time, we could get to [Manning] and hit him or get in his face. "At some point in the game, he started feeling us. He started squirming around in the pocket. Patting the ball a lot to get rid of it. The front four is the engine that pulls the train, the straw that stirs the drink, in Schwartz's defensive scheme. But after registering just eight sacks in the previous four games, the Eagles' defensive boss issued a challenge to his line earlier in the week. At his weekly press conference, he was asked whether he was getting enough production from the Eagles' other defensive tackle, Destiny Vaeao. Schwartz responded by saying, "We need more production from our d-line in general, our entire defense in general. They got one more and quite a few extra against the Giants, beginning with Kamu Grugier-Hill's interception on the second play of the game that set up the Eagles' first touchdown, a 13-yard pass from Carson Wentz to Alshon Jeffery. Defensive coordinator Jim Schwartz (right) and defensive backs coach Cory Undlin congratulate cornerback Jalen Mills after a fourth-down stop against the Giants. Even Vaeao, who has been starting at the other tackle spot this season while Tim Jernigan recovers from back surgery, registered just his third career sack. On a third-and-10 play in the second quarter, Cox lined up on the edge, got around Giants left tackle Nate Solder, and forced Manning right into Vaeao's lap. It was one of two third-down sacks by the Eagles – linebacker Nigel Bradham had the other one– who allowed the Giants to convert just four of 14 third-down opportunities. "The d-line is the most experienced group on this team as far as years playing in the league and all that,'' Cox said. "Jim always talks about that. [He says] the defensive line is what drives the defense, the team. In back-to-back losses to Tennessee and Minnesota, quarterbacks Marcus Mariota and Kirk Cousins continually frustrated the Eagles' pass rush by getting the ball out quickly. "Jim made some great adjustments,'' defensive end Chris Long said. "It affected the margin of time we had [to rush Manning]. Teams are going to seven-man protections. They're going to try and get the ball out quick against us. And there's no question who the engineer is. It's Cox. He has embraced his role as the defensive captain this season, is in the best shape of his career, and has openly stated that his 2018 goal — besides winning another Super Bowl — is being the NFL's defensive player of the year. Performances such as Thursday night's, in front of a national television audience, certainly won't hurt his chances. Said Bradham: "You see what he can do. He just takes control of the game.